How does your backyard look right now? Is it ready for your summer cookouts and get-togethers? If you feel like your outdoor area is too plain and boring, perhaps decorating your fence can help bring more life to it! And we’re not talking about a paint job or the more pricey option of building a new one! Fences are often regarded as merely walls that protect your property and keep intruders out. They actually are great backdrops for wall decorations. 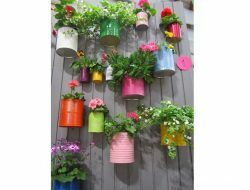 You can hang a vertical garden on it, tell a story using repurposed or upcycled materials as decors. We have a host of ideas for you to browse through for inspiration.